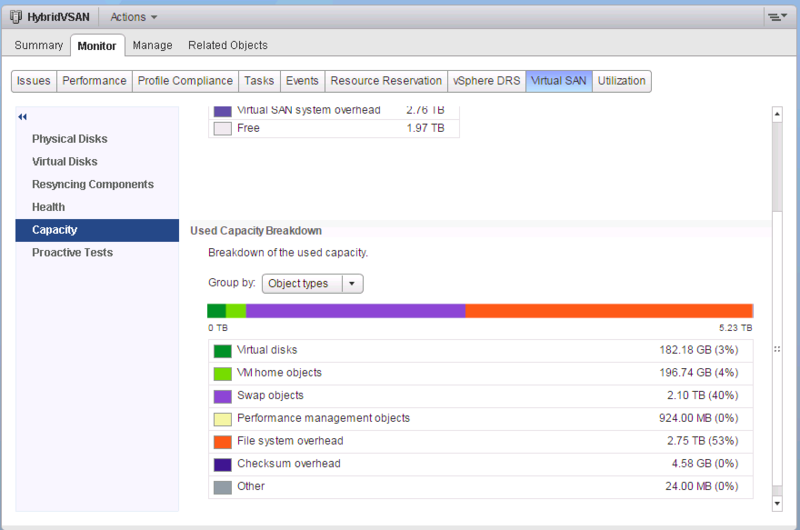 One of the Space Efficiency features of Virtual SAN 6.2 that is available for both All-Flash and Hybrid configurations, is the introduction of Sparse Virtual Swap files. Swap files on Virtual SAN by default, are created with the .vswp 100% reserved. In a thin provisioned/guaranteed capacity perspective, it could be said that they effectively Lazy Zeroed Thick (LZT). Virtual Swap files (.vswp) are created when a virtual machine doesn’t have a memory reservation equal to the amount of memory the virtual machine is configured to use. In short, a VM with 4GB of RAM configured, with no memory reservation will create a 4GB .vswp file. If a reservation is used, then the .vswp file will be the configured amount of memory minus the reserved amount of memory. The same VM with 4GB of RAM, along with a 2GB reservation, will create a 2GB .vswp file. Virtual Swap files are given a Number of Failures to Tolerate setting of 1 (FTT=1) with a Failure Tolerance Method of Mirroring or FTM=RAID1 (Mirroring). As the storage policy of FTT=1/FTM=Mirroring stands, each object with that policy will require 2x the space (1 Mirror). 200 virtual machines with 4GB of RAM each (I’m thinking a small VDI deployment) with no reservations, would require 200 x (4GB + 4GB) or 1.6TB of space. That’s significant! In cases where there is no memory congestion, and a virtual machine doesn’t use the swap file, it might be advantageous to have a swap file that is truly thin provisioned (the default in Virtual SAN). Having to determine this configuration across more than a few hosts can be a bit of a pain without some scripting/automation. 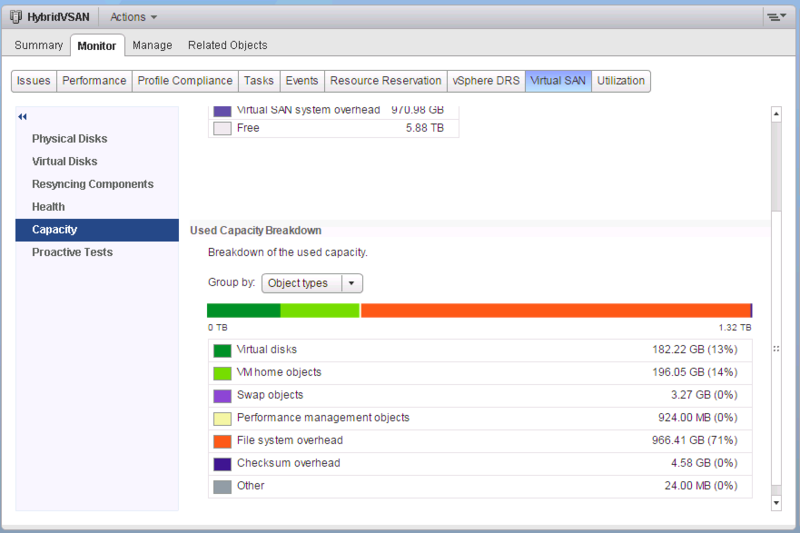 On a 4 node cluster I spun up about 500 virtual machines with 4GB of RAM allocated each, and no memory reservations. Those swap files, as well as FTT mirrors consumed over 4TB of capacity. *Note the .vswp Mirrors don’t appear in Swap objects, but rather File System Overhead. I powered off those virtual machines, changed the SwapThickProvisionDisabled setting, and consumed less than 4GB of Virtual SAN capacity. *Note the displayed File System Overhead includes mirrors of other virtual machines on the cluster. That’s a huge difference. I could run the above esxcfg command on my hosts, but that’s a bit problematic. I’d much rather script this. So I wrote a couple simple scripts for just that. First I wrote one to query each host for each of the clusters attached to vCenter. It also checks for vSphere 6.0 Update 2, as the setting isn’t valid with previous releases of vSphere. $Setting = Get-AdvancedSetting -Entity $ESXHost -Name "VSAN.SwapThickProvisionDisabled"
Write-Host " $ESXHost is set for Thin Swap Files "
Write-Host " $ESXHost is set for Thick Swap Files"
My hosts are set to SwapThickProvisionDisabled = 0, for Thick Swap Files. Another script Set-VSANThinSwap.ps1 changes that setting to SwapThickProvisionDisabled = 1. $SwapThickProvisionDisabled = Get-AdvancedSetting -Entity $ESXHost -Name "VSAN.SwapThickProvisionDisabled"
Write-Host "Updating VM Swap Thin Setting for $ESXHost"
Write-Host "$esx is already configured for Thin Swap Files"
And now each host will apply a space reservation of 0% to the .vswp files upon VM power on. Keep in mind that VM’s will have to be powered off to have the .vswp file space reservation policy change from 100% reserved to 0% reserved. Next PostThank You vMuch, Virtualization Community! I found that if I did an advanced storage vmotion of just the config file off and back on the VSAN that the swap space would be freed up. Thanks for the update Matt! Great info! Nice scripts. They will prove useful I’m sure. This setting could also be audited/managed by Host Profiles correct? This could be set in a Host Profile I believe. I’ll check the script. Much appreciated!